When individuals plan their new Connecticut custom home, they often spend a lot of time thinking about floor plans, home styles, flooring, countertops, kitchen cabinets, or other finishes for their home. And while all of those things are important, it’s sometimes easy for them to overlook one of the most essential design elements of all: lighting. Let’s take a look at why lighting matters in your new Connecticut home. The way you light your home plays a huge role in how you (and your guests) feel about being there. There are two distinctly different — and important — things to consider: Functionality and feeling (ambiance is perhaps a more elegant word). Let’s use the kitchen to illustrate what I’m talking about. If you look at the picture of a custom kitchen featured here, there are different kinds of lighting for different purposes. There is task lighting that illuminates those areas of the kitchen devoted to specific jobs. There are lights over the sink for washing and rinsing. There are under-counter lights for areas where someone might cut, chop, or season food. 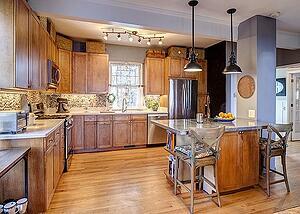 And there are also pendant lights above the kitchen island that helps when preparing a meal or eating. Each of those kinds of lights helps make the kitchen a comfortable and pleasant place to prepare meals — and even to eat a casual meal. Keep in mind, however, that with many of today’s floor plans, the kitchen is open to other public rooms. So while you may want plenty of bright task lighting while you’re working in the kitchen, you will also want ambient lighting when you’re done working and want to sit comfortably in the adjoining family room with guests. Of course, a lot of people hang out in the kitchen to socialize. But bright task lighting doesn’t really create the right atmosphere for that. So you want softer, ambient lighting that creates a comfortable environment. The same thing is true for other rooms in your home. You’ll want comfortable ambient lighting for your family room that’s conducive to casual conversation. But you’ll probably also want lighting for reading. And you may even want very dim lighting for when you want to watch a movie. It’s the same for your bedroom. You’ll want general lighting for when you walk into your bedroom at night (easily accessible from the doorway). But you’ll very likely also want reading light for when you’re in bed. And you may want the ability to have light on each side of the bed so you don’t disturb your spouse. The master bathroom is another place where good lighting can make a huge difference. General overhead lighting may be fine for getting something out of a drawer or brushing your teeth, but it can be frustrating to apply makeup or shave in harsh general lighting. The point is, you can plan ahead for many of these situations. When you sit down to discuss plans with your builder, don’t overlook your lighting needs. It’s so much more efficient to build the lighting you want into the plan than it is to try to add it later. So make sure to add lighting to the list of things you want to go over with your builder before construction begins.